It’s just another night at the morgue for coroners Tommy (Brian Cox) and his son Austin (Emile Hirsch) - that is until an unidentified corpse comes in. Discovered buried in the basement of the home of a brutally murdered family, the young Jane Doe - eerily well preserved and with no visible signs of trauma - is shrouded in mystery. As the pair work into the night to piece together the cause of her death, they begin to uncover the disturbing secrets of her life. Having loved André Øvredal’s 2010 found footage film, Troll Hunter, The Autopsy Of Jane Doe was high on my must-watch list. In addition, the movie intrigued the horror fan in me - a murder mystery wrapped up in an autopsy? Count me in! Of course, this storytelling concept will not appeal to everyone and The Autopsy Of Jane Doe is certainly not for the fainthearted. However, the autopsy scenes were for me the best part of Øvredal’s film. The physical effects are truly remarkable - even though many made me squirm. Meanwhile, I loved the idea of the body offering up its secrets as Tommy (Brian Cox bringing real gravitas to this role) and Austin go about their work. Øvredal makes the autopsy both unsettling and fascinating to watch. Olwen Kelly is impressive as the Jane Doe. It seems strange to describe her role as a corpse as a “performance” but, even as she lies unmoving on the table, hers is a formidable and powerful screen presence - one that, thankfully, does not feel exploitative. Unfortunately, The Autopsy Of Jane Doe does not stay true to its gripping and innovative beginning. Disappointingly, the film takes an all too familiar horror movie path instead. We’ve seen it all before and much of the film’s third act (with its 'big' reveals) feels clunky and contrived. However, while I still prefer Troll Hunter, I would recommend The Autopsy Of Jane Doe. If you are not too squeamish, the film’s physical effects alone make it worth a watch. 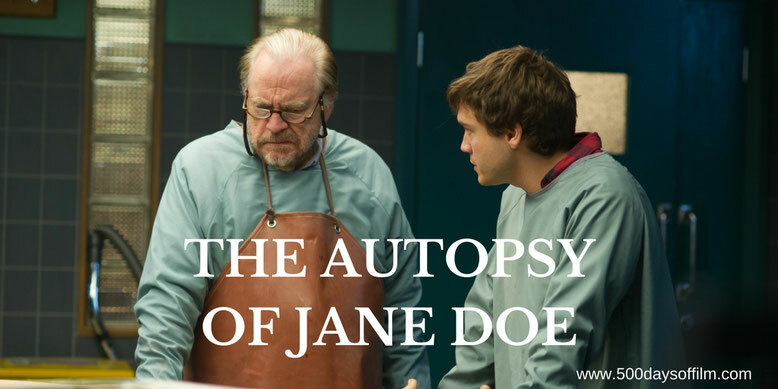 Have you seen The Autopsy Of Jane Doe? I agree... glad you enjoyed it! I thought it was great till the cheesy horror movie ending. Emil Hirsh deserves plaudits too.